That’s an incredibly ambitious statement, but Surfista Travels head trainer Elaine Abonal says it so sincerely as to leave no doubt of its truth. I am feeling a massive amount of doubt in myself, though. Siargao island’s pounding surf feels a world away from where I currently sit — in the dry, cushioned comfort of Turtle Surf Camp’s common area, alongside fellow Surfista campers Louie-An, Gil, Natasha and Nicole. Louie-An and I are the only two absolute noobs in the bunch. Gil, Natasha and Nicole are no strangers to the surfboard, and all three have crossed international borders to attend Surfista Travels’ camp — Gil from the UK, and Natasha and Nicole from Singapore. Speaking solely for myself, I am 100% landlubber. My knowledge of the sea ends where I can no longer stand with my neck above water. What do I know about riding a wave on a surfboard in the open ocean? I’m about to find out. Surfista Travels, and the multiple surf breaks down Siargao’s east coast, are here to see to that. At 7am, we hit the beach directly across Tourism Road from Turtle Surf Camp. We’re each assigned a personal instructor, hired from among Elaine’s local contacts in the Matanjak Surf School. My instructor, Piro, is a wiry, tanned guy with bleached hair and a never-ceasing smile. Using a board resting on the sand, Piro drills me on the proper technique for the “pop-up” — the energetic push-up that should (theoretically) bring me from a supine position to a standing position. I practice my pop-up again and again, pushing up with my arms while rapidly bringing my feet into position on the board. Piro tuts his disapproval. “You’re using your knees!” he scolds. I can’t help it; my arms don’t feel strong enough to make that solid push upward without a kneeling assist. “You won’t be stable enough to get upright; you’ll wipe out on your first try,” Piro warns me. I find out exactly what he means when we finally get into the water. A short boat ride takes us from the beach to Matanjak surf break; the whole gang drops their boards into the sea and jumps in after them. It’s just a 10-minute paddle from the boat to Matanjak, but my lack of training betrays me. Elaine’s words ring in my head: “90% of surfing is paddling.” By the time I’m in position, my arms and dorsal muscles are throbbing, and I’m completely winded. Surfing requires considerable upper body strength and stamina. This is not something you want to learn when you’re right in the path of the breaks, not to mention the other surfers riding them. Worse, my 90kg mass is simply too top-heavy for our slim 9ft longboard. Never mind standing; just staying on top of the board, lying belly-down, proves almost impossible. Elaine salvages the situation by telling me to forget about the pop-up for today. I am going to bodyboard instead. Piro guides me (still belly-down on the board) to a rising wave, then lets go. A powerful wave takes hold and I accelerate towards the shore. Fun is a little slow in coming, but we get there. Over the next few days, we switch to a much larger paddleboard that probably served as a Siargao-to-mainland ferry in a previous life. Piro watches from a distance as I stand, wipe out, stand again, then wipe out again. The waves aren’t as powerful in June as they are during peak season between August to November, which is perfect for beginners but not as fun for experienced surfers. We’re enjoying it in any case; the moderate weather has tamed even the ferocious Tuason Point surf break. “You’re doing it!” Piro yells as we near the end of our session on the third day. “You just need to align your feet with the center line, and stop walking forward!” He sounds even more excited than I am. With a more stable and forgiving board, I’ve gained a little more confidence and am beginning to shed the habit of intellectualizing my actions, learning to go with the flow instead. Trust your body. Trust your feet. Trust the board. Free of analysis paralysis, I am making the transition to surfing upright, for about seven to eight seconds per go anyway. I am not going to get as good as Gil, the Singaporeans, Piro, or Elaine in three days, but I am happy to take what I can get — a Zen-like appreciation of surfing as a mind game that I beat little by little, day by day, bruised ribcage, scratched-up shins and an overall body soreness notwithstanding. My fascination with the ocean is equal only to my fear of it. I grew up in landlocked Concepcion town in Tarlac province, at a time when there were no public pools and no swimming lessons to be had. I also realize, rather belatedly as I write this piece, that my family never went to the beach. Although Zambales and La Union are relatively nearby, our family gatherings always took place at my grandparents’ home, never out in the sun or frolicking in the waves. Then, when I finally started going on beach trips, I learned I had an allergic reaction to sea water that made me break out in hives. It’s a shame really, because the Philippines has some of the world’s most enviable beaches. Although I did take swimming lessons eventually, I have yet to conquer my fear of the deep end. My exposure to yoga, however, has allowed me to meet people with different passions, including surfers, who often practice yoga to re-create “the flow” on the mat while honing their surfing skills. What all of them have in common, apart from their killer physiques, is a palpable, almost fanatical, devotion to surfing. They seek a kind of peace that seems somehow absent on land. Despite my complete inexperience in anything that involves water, I grew intrigued with the sport that had them so enthralled. Then came this assignment. I jumped at the chance to experience the world-famous surf spot Siargao, saltwater allergy be damned. Fellow writer Mike Aquino and I made our way to the island and were met by a smiling and hugging Elaine, whose energy says a lot about her — how much she loves being with people, and how passionate she is about surfing. I have come to think that those with an affinity for the ocean exude an energy of levity, authenticity, generosity and openness. Meeting Elaine was a great starting point for this adventure, and I felt relaxed. I love that Siargao has a small-town vibe despite being a top tourist destination. Residents bristle at the thought of it becoming the next Boracay, and are fully aware of what rapid commercialization can do to its tranquil, laid-back atmosphere. As a vegan, I was also delighted to find that there were better food options here than other tourist places I’ve been to in the Philippines. 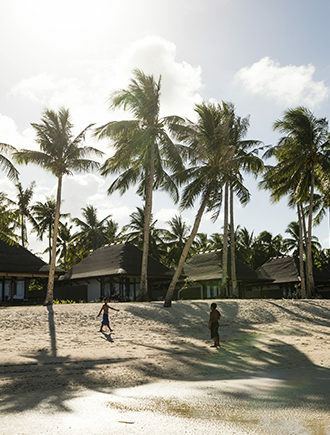 More things to love: Turtle Surf Camp Siargao, where we start our lessons, has a simple and charming tropical aesthetic that will make anyone — surfer or non-surfer — want to move in, permanently. After settling in, the interesting part begins. It’s time for those surf lessons. The first session is where I learn the most, and achieve the least. I’m not exaggerating when I say I came face to face with my fears on this trip. I am cradled and then slapped around by waves, sometimes at the same time, an overwhelming sensation. Lying belly down on a surfboard with fathoms of water below is more than my inexperienced land-based body and brain can handle. I am lucky enough to be paired with Dom, my patient, sassy and funny instructor. He is shocked that I jumped in the water at all after I tell him about my water dilemmas, and goes into full therapist mode when he sees how dejected I am at being a sucky first-timer. He assures me that tomorrow will be different. With my feet, knees and body spotted with bruises and my pride shredded, he takes me back to the resort where I lick my wounds. How many times do you need to fall before you get up? That depends on how fast you learn your lesson. The next day, Dom and I set out again and he tells me excitedly: “Today is your day to shine.” I chuckle at this declaration, not only because this tattooed, muscle-bound guy just talked like a shampoo endorser, but also because I believe it. Miraculously, my skin does not break out. No antihistamines needed. I think to myself: the universe is giving me the encouragement I crave. When you manage to stand up on a moving board that’s being swayed by choppy waves, even for just a few seconds, you get hooked. You’re a goner, like a teenager kissed by a long-time crush. You want it again. So you go back, stand up, and get wiped out. You try again. This goes on until your body gives up on you. You notice that your legs and feet are riddled with bruises, but you don’t care. Later on, you realize your arms feel more like limp noodles than arms. But yes, you will do it again. Because now that I’m braver, how can I stop? This article originally appeared in the September 2016 issue of Smile magazine.